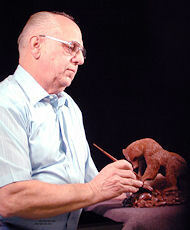 Allan Schwindt has been intrigued with Art and Wildlife for more years than he cares to remember. Soon after he began drawing he was introduced to whittling by his dad. Since then, (about age 5) he has never been without his pocket knife and he feels that this early exposure to whittling was the key to his learning to see things in 3-D. So, it is not surprising to see his development in the art world as a sculptor. Allan's dad was also an avid hunter and fisherman and his successes sparked an early interest in field sports for Allan. As he learned the art of hunting and fishing he also gained a genuine respect for the wildlife he hunted. This leaves little mystery why so many of his sculptures are wildlife and sporting scenes that depict his experiences in the field. 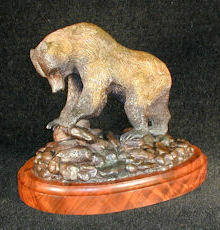 Whether in a bronze of a Grizzly Bear foraging for food or of a small herd of Antelope racing across a plain, the Oregon-born artist captures the spirit of the animals and birds in their most natural behavior and settings. Each piece is original, powerful and authentic, and is based on over 50 years of study ranging from studies at the University of Oregon to extensive research and traveling in the U.S., the Caribbean, Canada, the Orient and Africa. Allan's art appears in private and corporate collections in ten countries and is part of the permanent exhibit at the International Wildlife Museum in Tucson, Arizona. In addition to sculpting wildlife, Allan has also accepted commissions to sculpt portraits, bas-relief commemorative plaques and domestic animals including dogs and horses. He has been president of Wildlife Artists of the World, an exclusive organization of 21 international artists dedicated to establishing standards of excellence in wildlife art. To ensure anatomical accuracy and authenticity in his sculpture s, Allan photographs, sketches and thoroughly studies a wildlife subject and its habitat. He then sculpts the original in wax or clay, and then makes rubber molds and wax patterns in his studio before sending the piece to a foundry for casting in the lost wax process. When the rough cast-ings are returned, Allan finishes the sculpture by removing the weld beads, retexturing the surface, and applying a final patina. 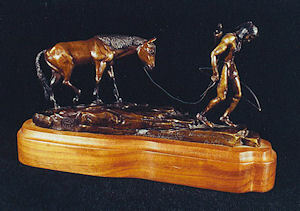 As a result of his control over the molding, casting, and finishing procedures, each of Allan's sculptures is both unique and a true replica of the original. 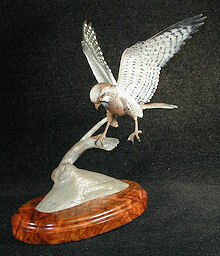 His individual attention to a casting, from pouring of the first wax pattern, to the mounting of the bronze on a hand-finished hardwood base, ensures that the finished piece meets his highest standards of quality. Substantial discounts are available to legitimate groups that purchase more than one piece.